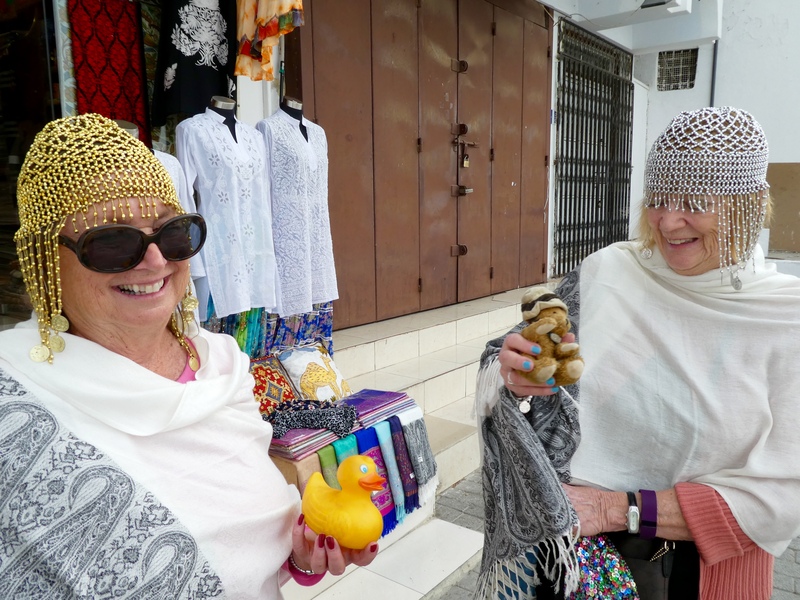 Abu Dhabi, Dubai and Muscat–We loved them all! Back home, we are remembering some of the wonderful experiences we enjoyed in Abu Dhabi, Dubai and Muscat. 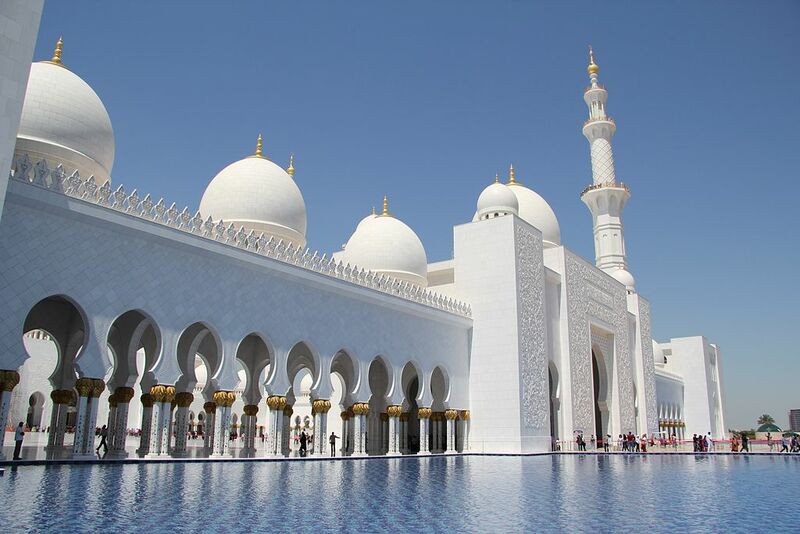 Sheikh Zayed Grand Mosque in Abu Dhabi was beautiful. Front of Sheikh Zayed Grand Mosque. Photo from Wikipedia. And we, as non Muslims, were able to go inside to see the largest carpet, largest chandelier and the grandeur of this mosque. 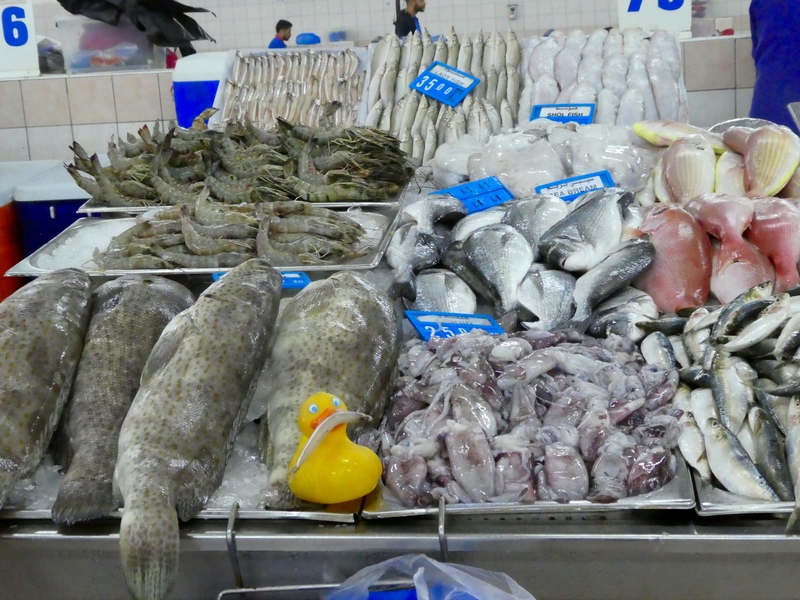 The fish market was fun and I, Zeb the Duck, got a fish. 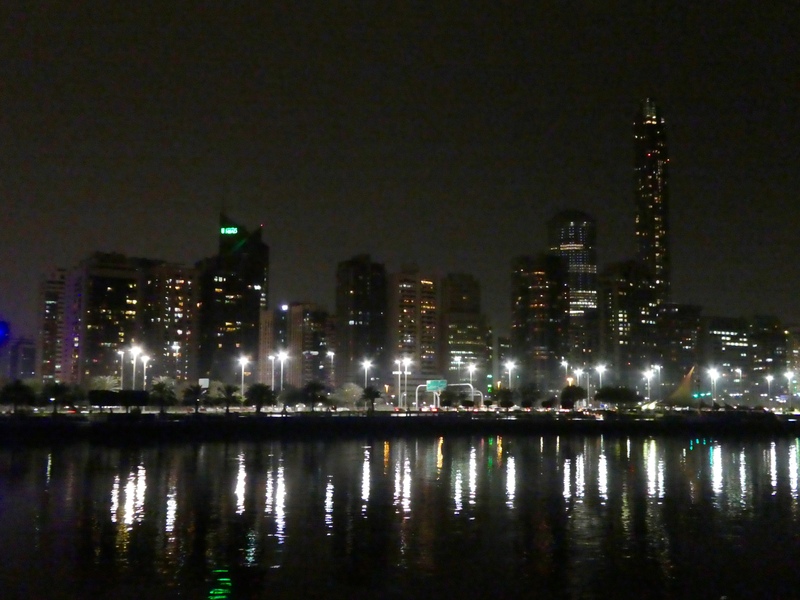 An evening boat ride, dinner included, showed us old and new on the Abu Dhabi sky line. 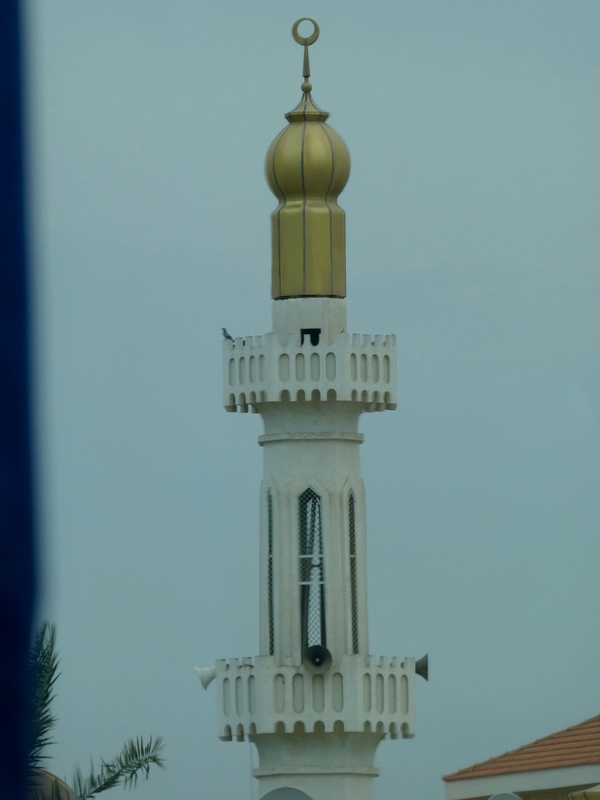 A common sight, and sound, throughout our Middle East adventure, the minaret of a mosque with a speaker for the call to worship. 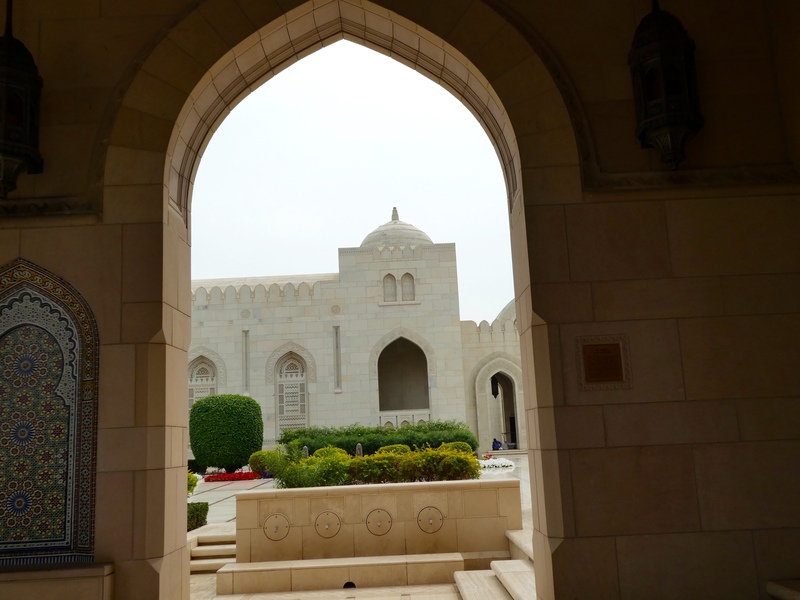 We gave up a free day in Abu Dhabi to experience a little of Muscat, Oman. Here we saw some old and some new. 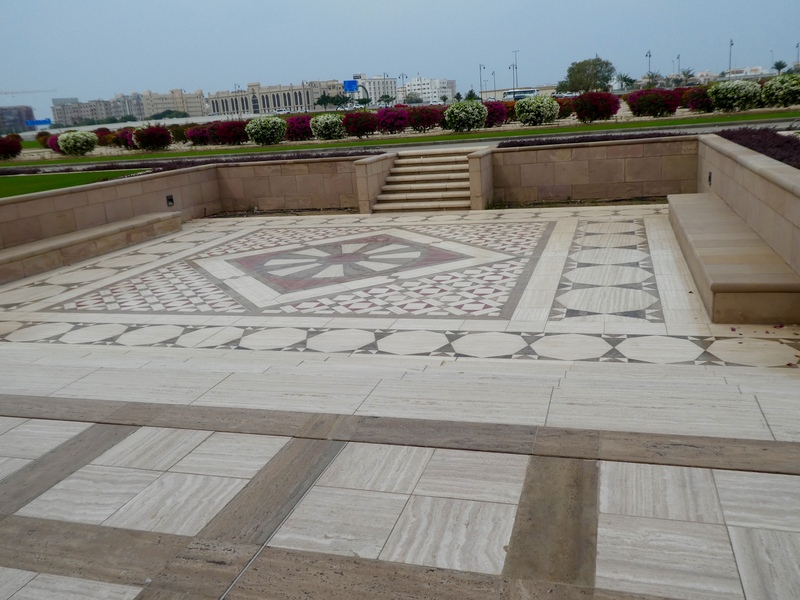 Muscat is a few thousand years old. 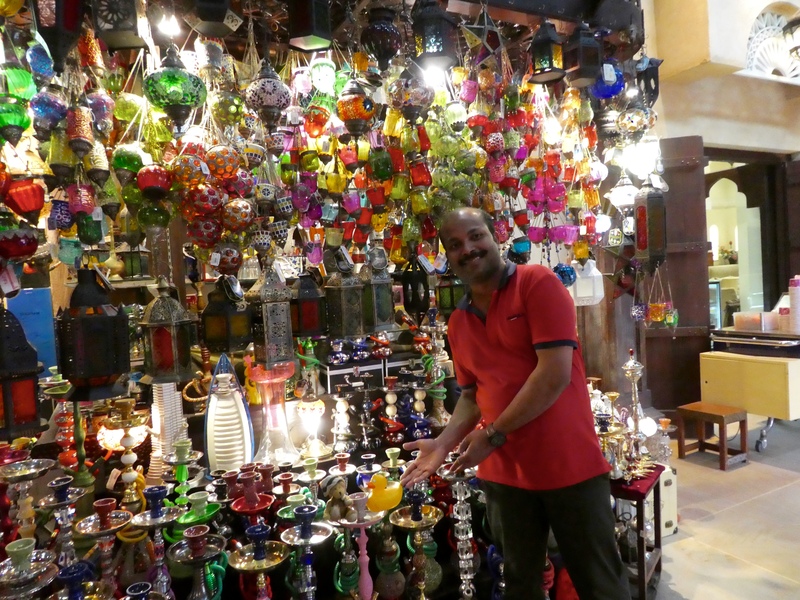 We loved wandering through the souk. 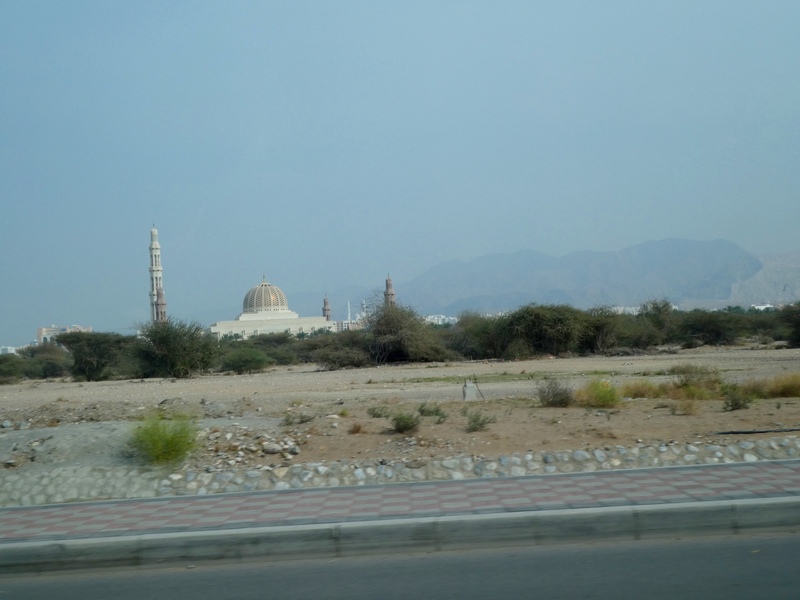 Driving through Muscat, we appreciated the absence of too many cars and the accompanying car noises. 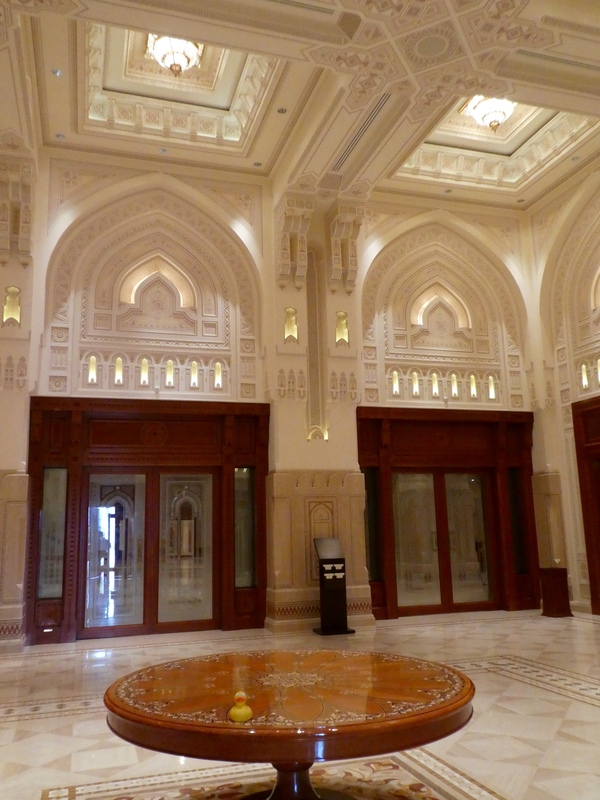 Here, our guide shows some of the new: The Royal Opera House of Muscat, Oman. 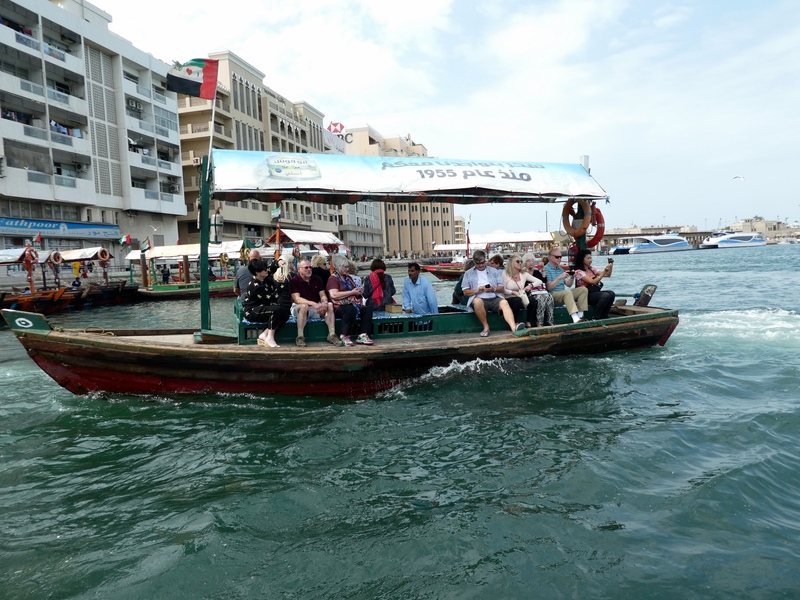 Back to the United Arab Emirates, in Dubai we rode a traditional boat, or dhow, to cross Dubai Creek. 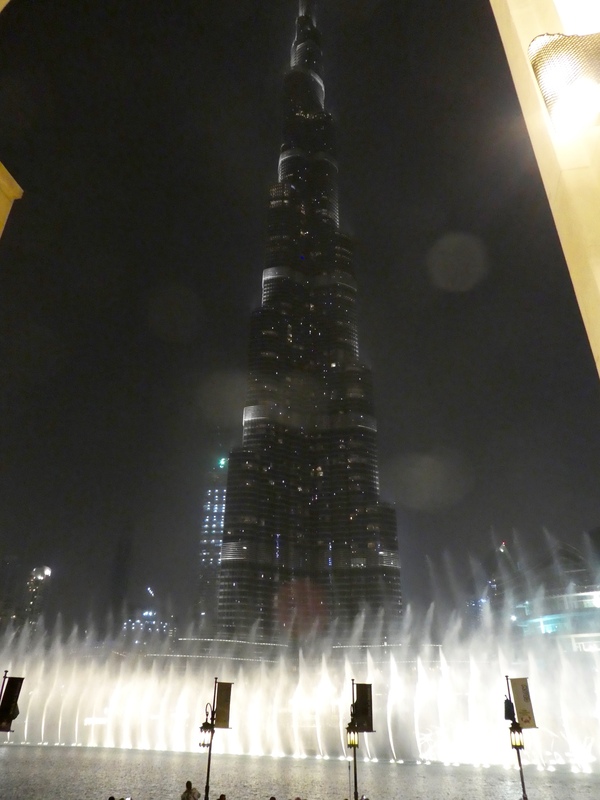 We admired Dubai Fountain with Burj Khalifa, the world’s tallest building, all connected with Dubai Mall. 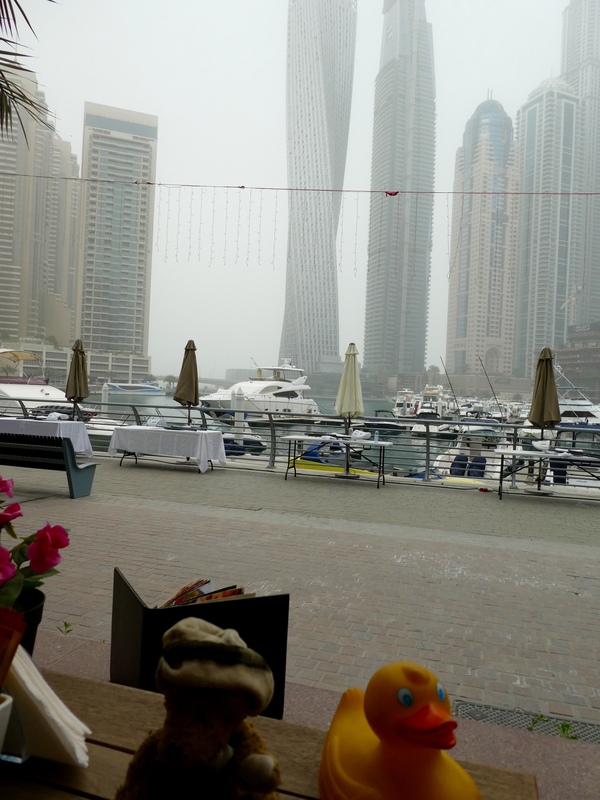 Dubai Marina was bustling, but still relaxing for our lunch stop. 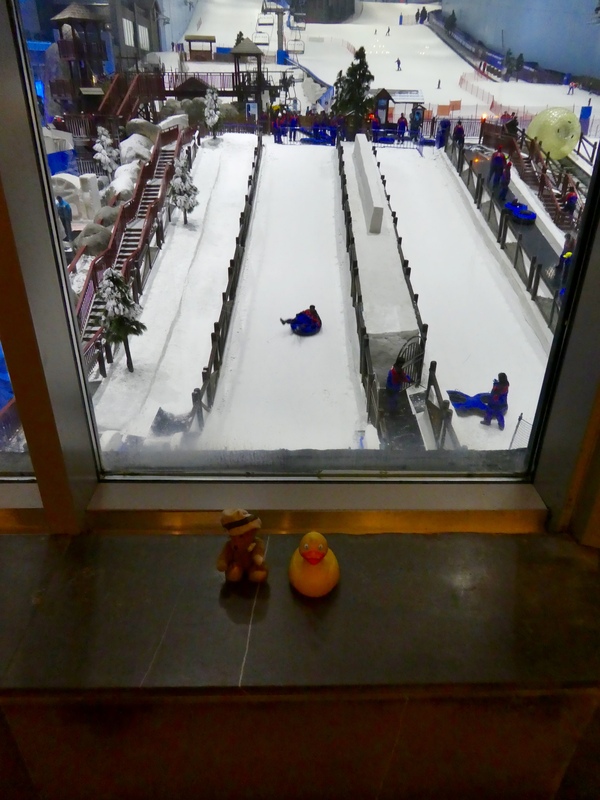 Mall of the Emirates provided indoor snow skiing and tubing on snow, in additional to fabulous dining and shopping. 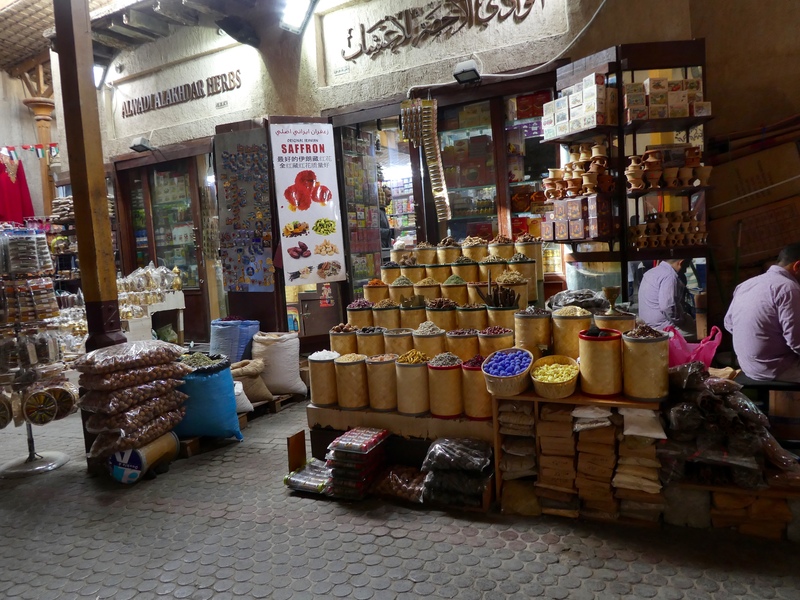 Souk Madinat Jumeirah was a modern souk. 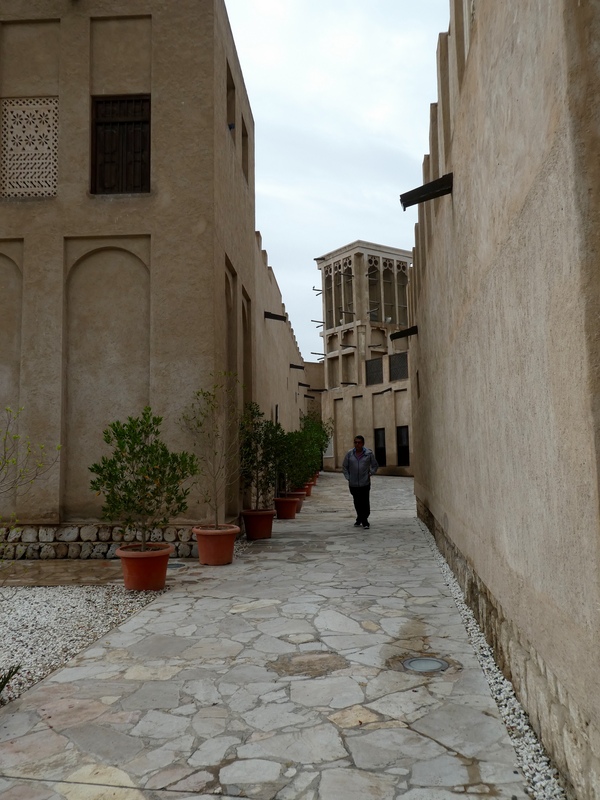 The narrow alley of Bastakia Heritage Area showed life before oil and oil money forever changed Dubai. Aromas from the spice souk will be with us always. Of course we loved the animals. 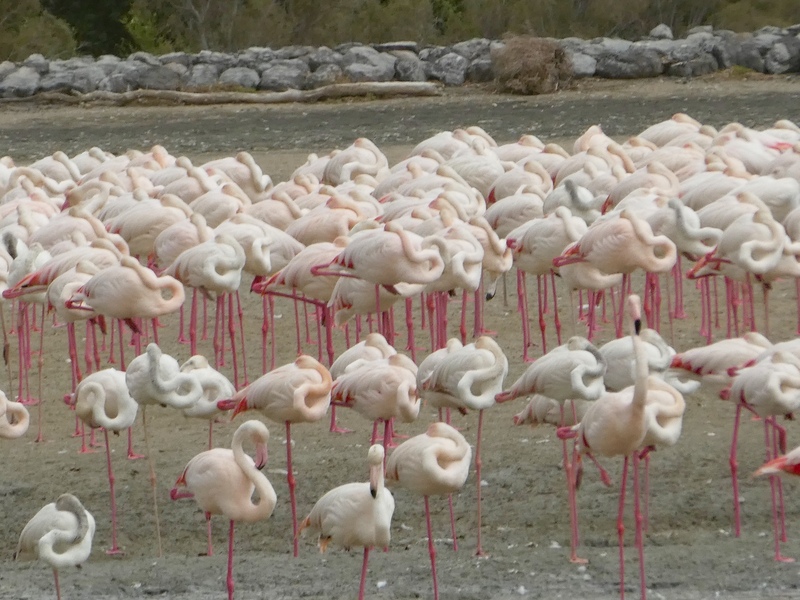 The unexpected flock of flamingos were wonderful to see. 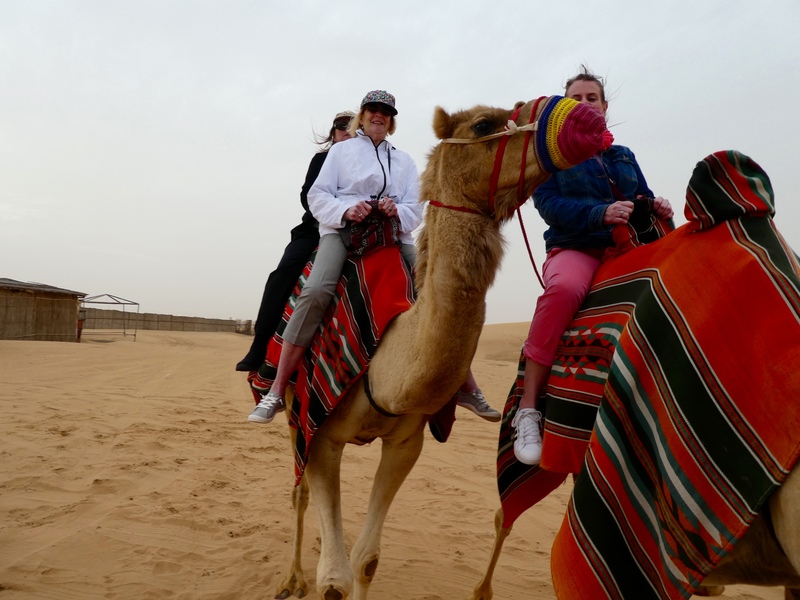 And riding the desert native, a camel, made our trip even more memorable. 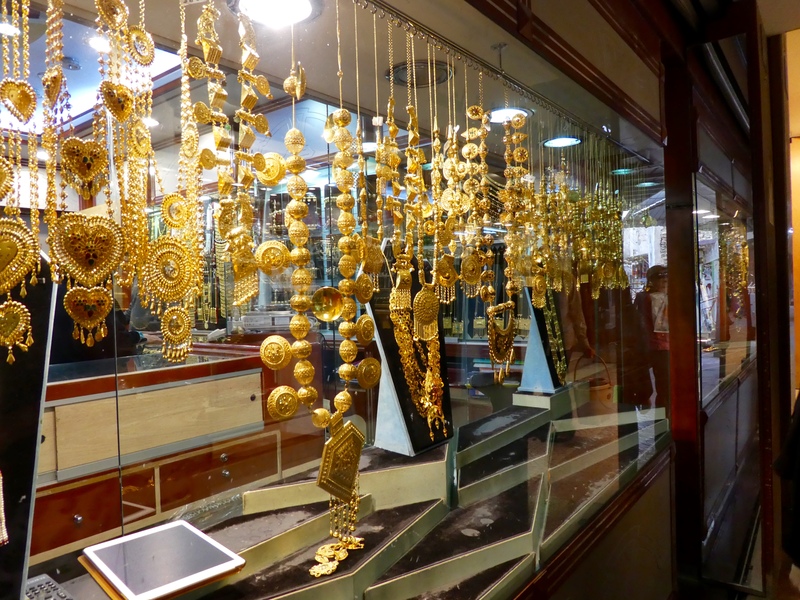 Of course we will never the gold souk with those huge gold necklaces and gold hats. But our fondest memories are of the kind, welcoming people we met. Our trip was a tour through http://www.SmarTours.com. We have taken tours from them previously. This was Deluxe Dubai and Abu Dhabi. 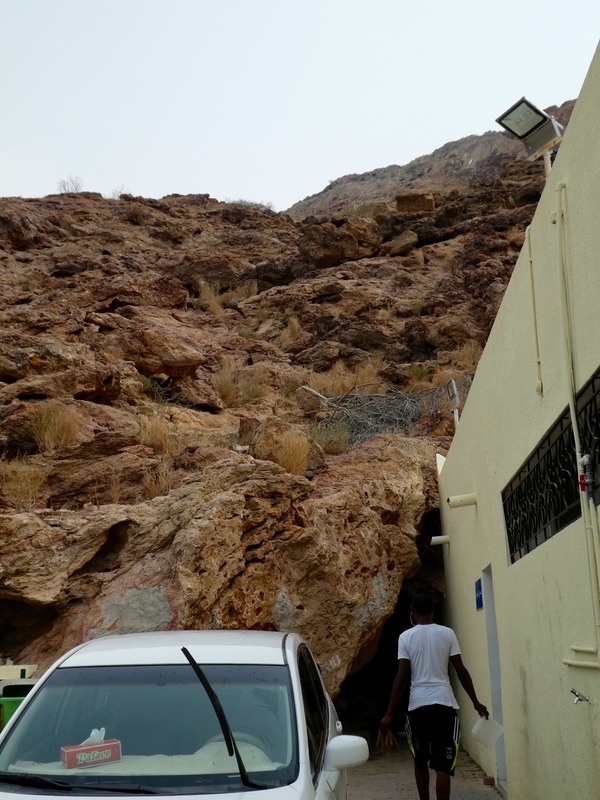 The day trip to Muscat, Oman, was not connected to SmarTours. Chanel’s mom made separate reservations for us and we loved our day in Oman. We hope you visit Abu Dhabi, Dubai and Oman soon. We loved it. 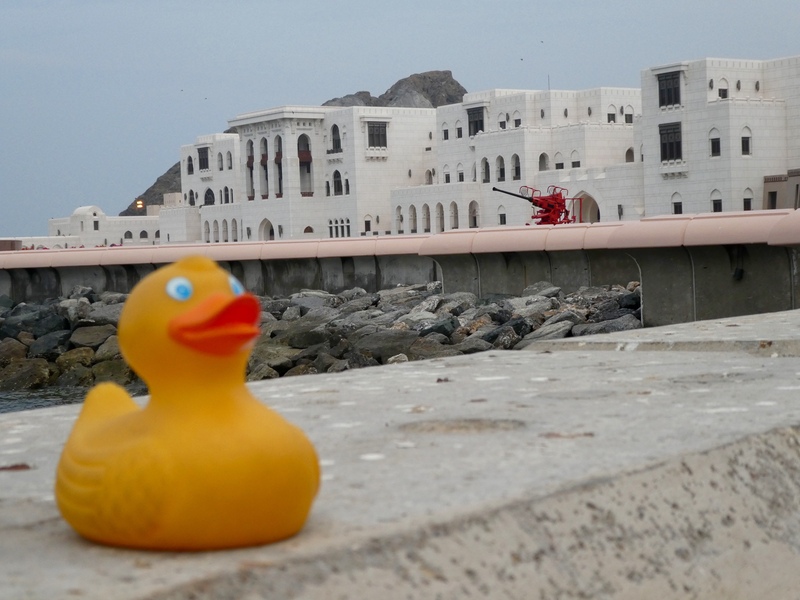 Zeb and Duck and Chanel the Bear are heading for a museum in Muscat, Oman. 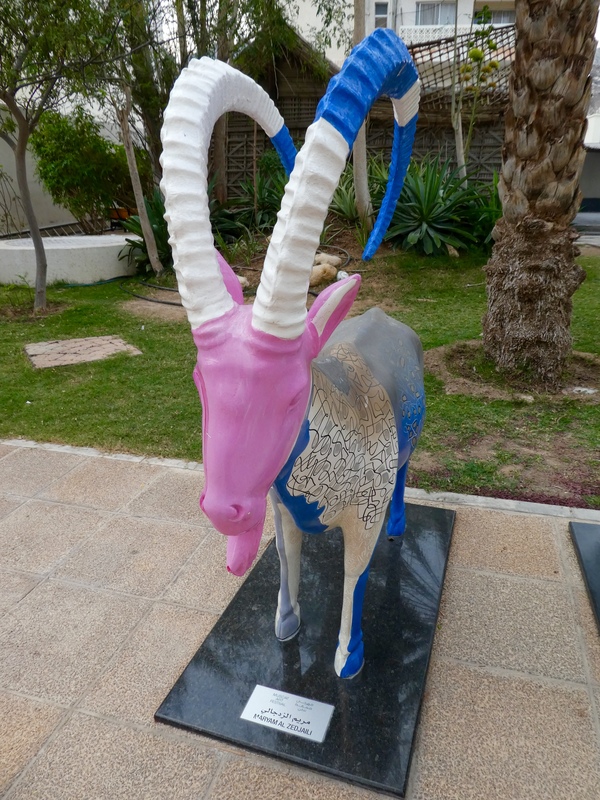 As we approach the entrance, we love these animal statues. 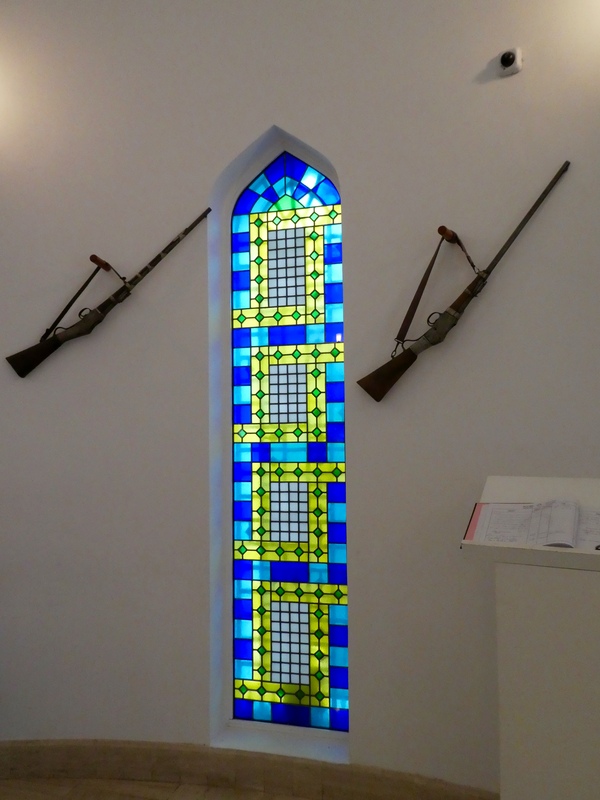 In the lobby, while our guide gets our tickets, we admire the window and the weapons on the wall. 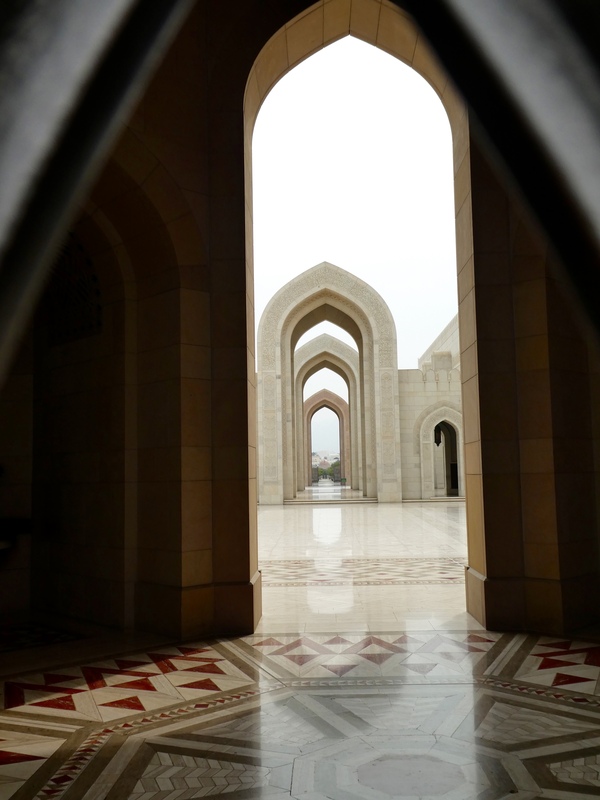 Looking through to the building we see many artifacts of Oman’s long history. But, the lady says mom cannot take photos inside. Sad, but we enjoy looking at so many items, current and ancient. After much time enjoying the exhibits, we exit, only to find there is more outside. These boats are typical of those used years ago and even used today. Look at this model of ancient Muscat. I really liked the pink head on this one. 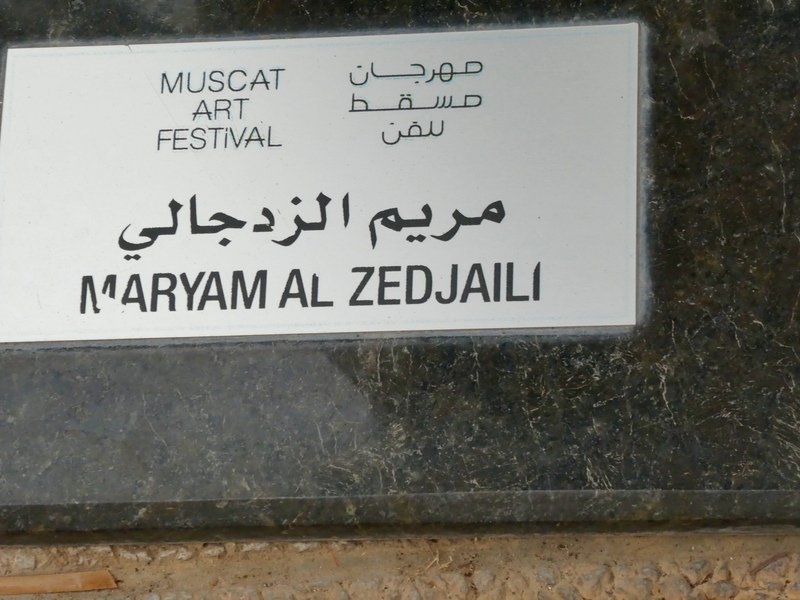 These were for a Muscat Art Festival. 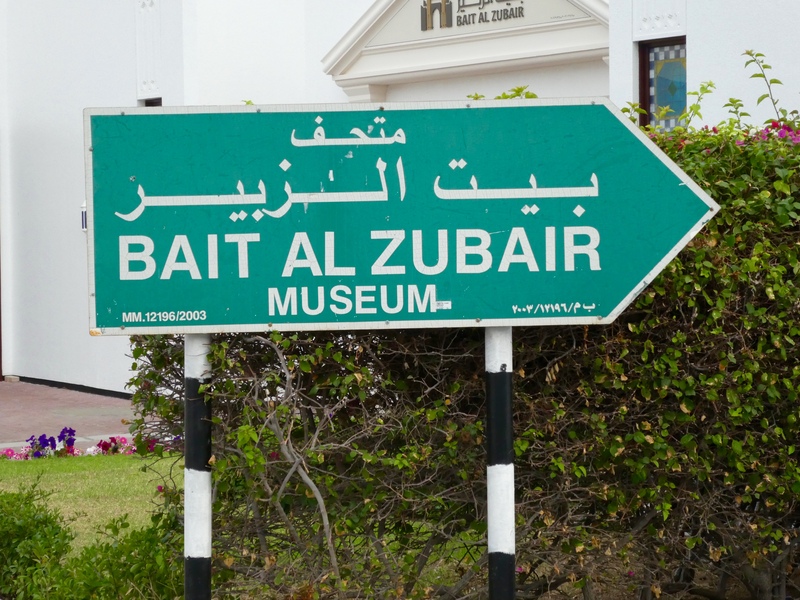 Leaving the museum, we drive through Muscat. Aren’t the mountains great? 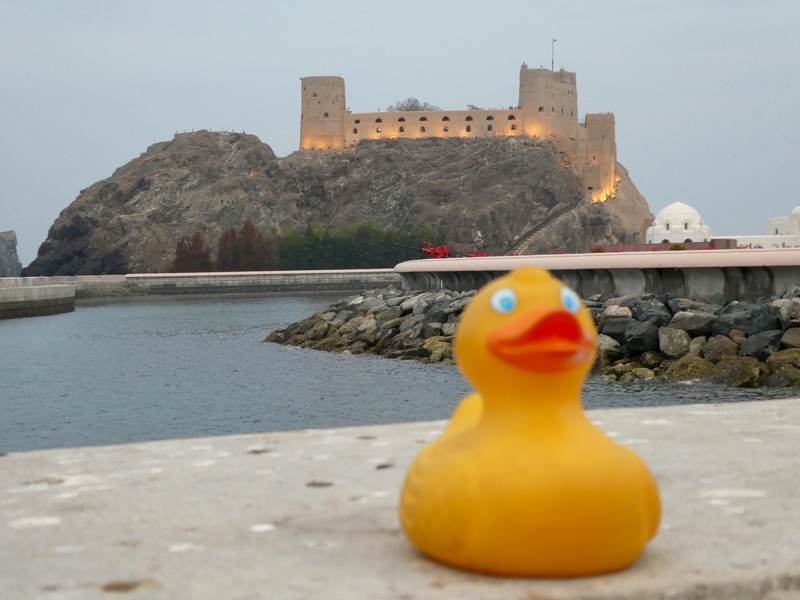 We see an old fort on a hill near the water. This huge white building is another palace. Now visiting dignitaries and emirates stay here. I guess they didn’t know that Chanel the Bear, and I, Zeb the Duck, are dignitaries in our world. We were not invited to stay here??? Maybe next time? This panorama shows some of Muscat’s old area and buildings. Isn’t this a beautiful place? Well, our time in Muscat has come to an end, and we enjoyed it very much. 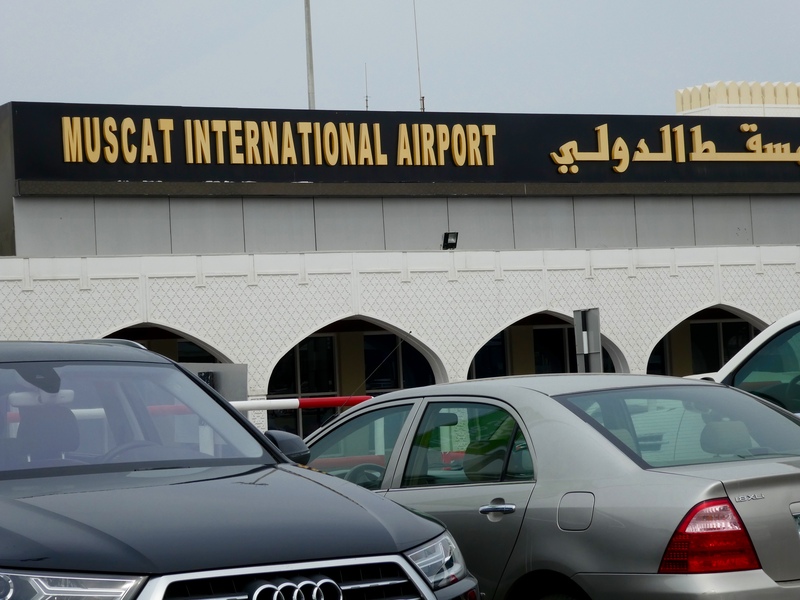 Back to Muscat’s airport, on the plane, and back to Abu Dhabi, another eye scan, and a cab back to our hotel. We loved Oman and we love Abu Dhabi. 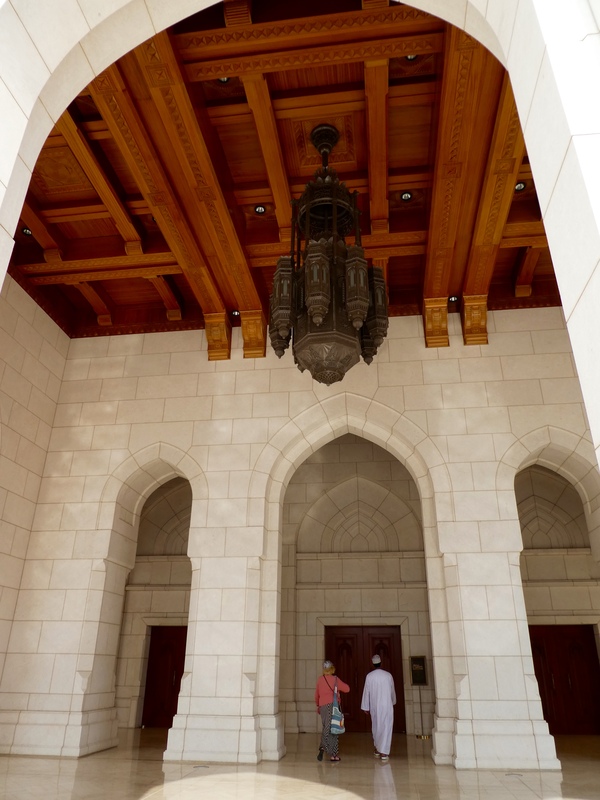 When you visit Muscat, perhaps you will plan to be there when tourists can enter the Grand Mosque and the Opera House. But, if not, you will still see and experience so much. We hope to hear that you will visit Oman. It is a fascinating country. 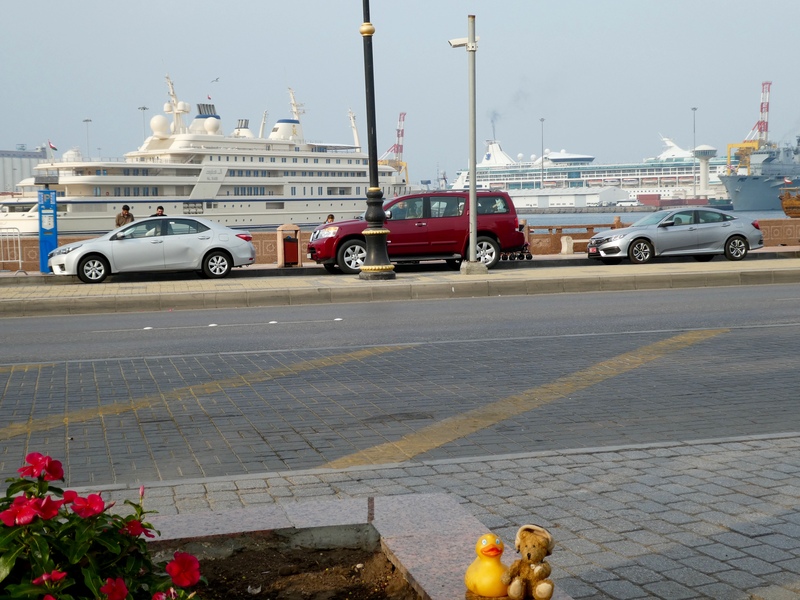 Cruise ships on the Arabian Sea near a great souk mean Zeb the Duck and Chanel the Bear are happy. 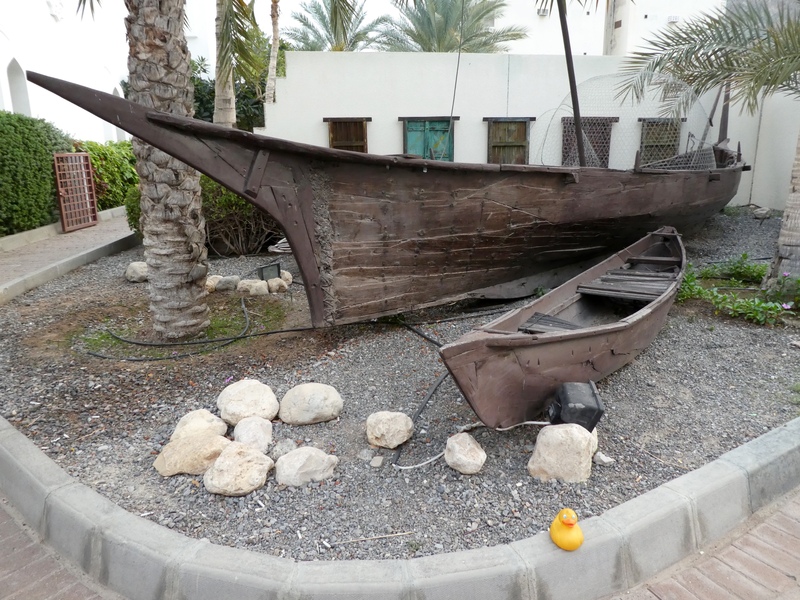 Near the cruise ship, we really like this traditional boat. We love the traditional boats also. We love to see traditional things mixed with the modern. Now we know we really are on vacation in a new destination. Here in Muscat, Oman we are shopping. 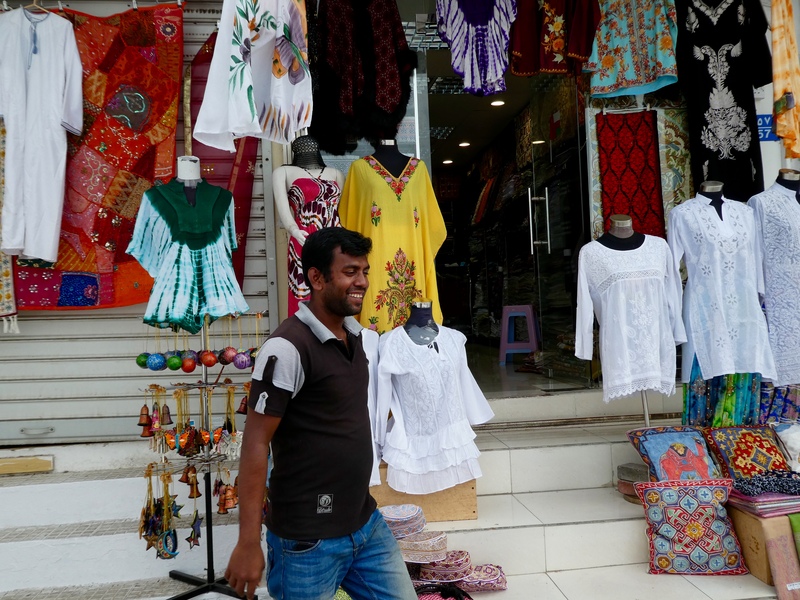 One of the best things about the souk is talking with the people here. The items in this store caught the attention of our moms. We really like the man here, also. Oh no, our moms sure look different now. The friendly gentleman showed them, and us, how to wear the head covering, or hat. The shawls are a nice addition also, moms. As we were about to enter the narrow alley of the souk, our moms saw post cards that they really needed. 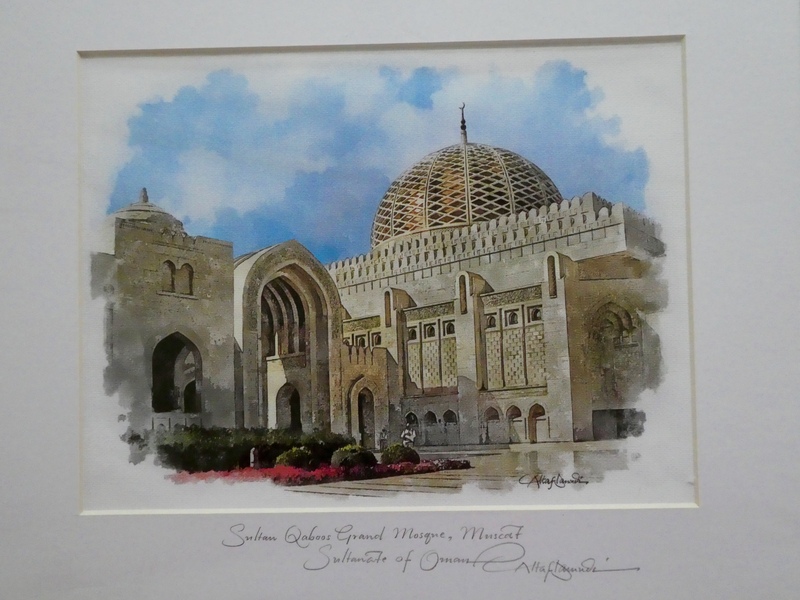 Going further into the store, mom spotted this painting of Sultan Qaboos Grand Mosque. As you can guess, this painting is now in our home in Colorado. This is a great souk. These narrow walkways are lined with small shops and friendly, but not aggressive owners. Many offered myrrh and frankincense. We were fascinated, but did not purchase any. You may know that the Christian Bible teaches that the Magi brought myrrh, frankincense and gold to the baby Jesus. Myrrh and frankincense come from tree resin and we saw much perfume and incense of myrrh and frankincense in the souk. Oh dear. Look at this gold. Our guide assured us that it is all read gold and most is 18 karat gold or higher. Again, no purchases today. There really is not enough time to see things and decide on major purchases today. But looking is fun; the sales staff is friendly and informative. I love this place! It is time to leave the souk, get in the car and drive to our next destination. Notice that the roads are very good and not a lot of traffic. 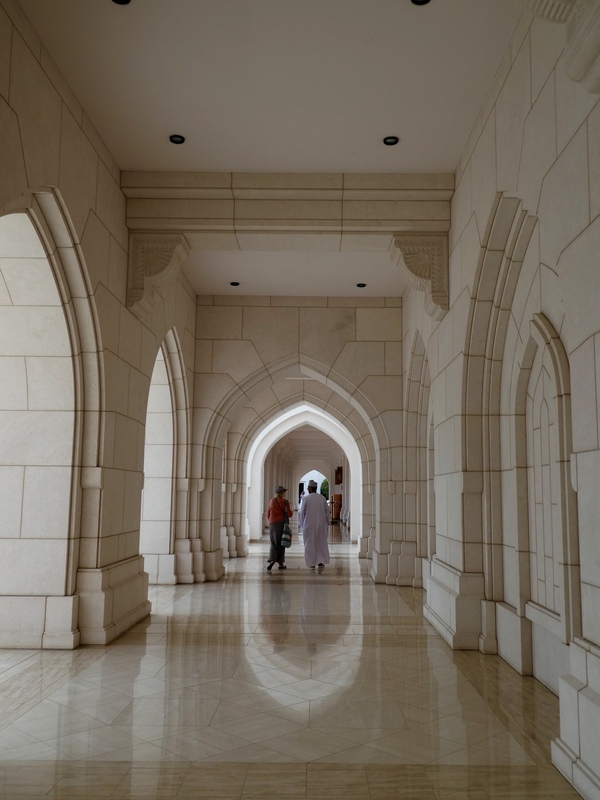 Oman, or officially the Sultanate of Oman, really is a great tourist destination. We do not see much information about visiting Oman in the United States. Oman offers desert trips. A favorite is Sharqiya Sands, or Wahiba Sands as it is locally known, a desert area inhabited by the bedouins. With Persian Gulf and Arabian Sea coastlines, you may enjoy Ras al Hadd, a Turtle Reserve and beautiful beach. Maybe you would prefer Khalif Beach with soaring sand dunes for a backdrop. Of course many old and new buildings and lots of Middle East history here. It would be so much fun to return to Oman for a week or two. Mom? World class opera performances in the desert? Yes! 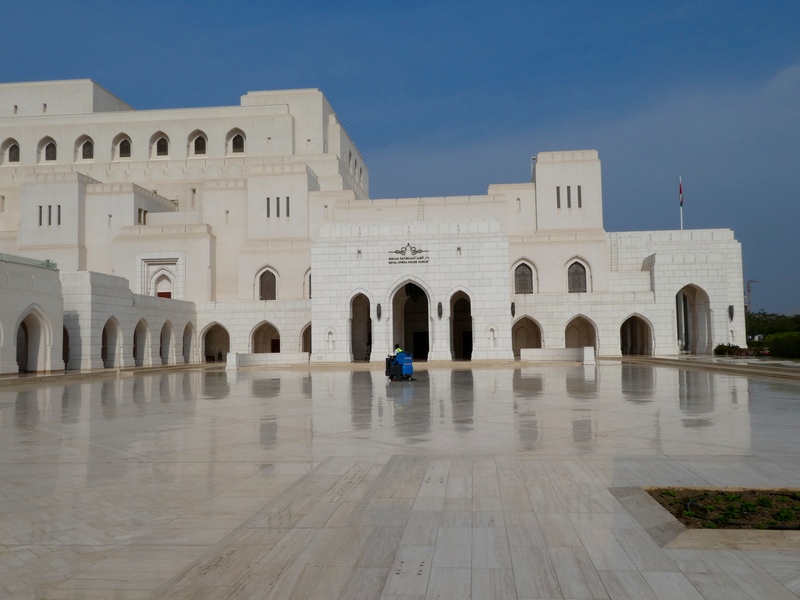 The Royal Opera House of Muscat opened October, 2011 and has been featuring some of the best entertainers from around the world ever since. 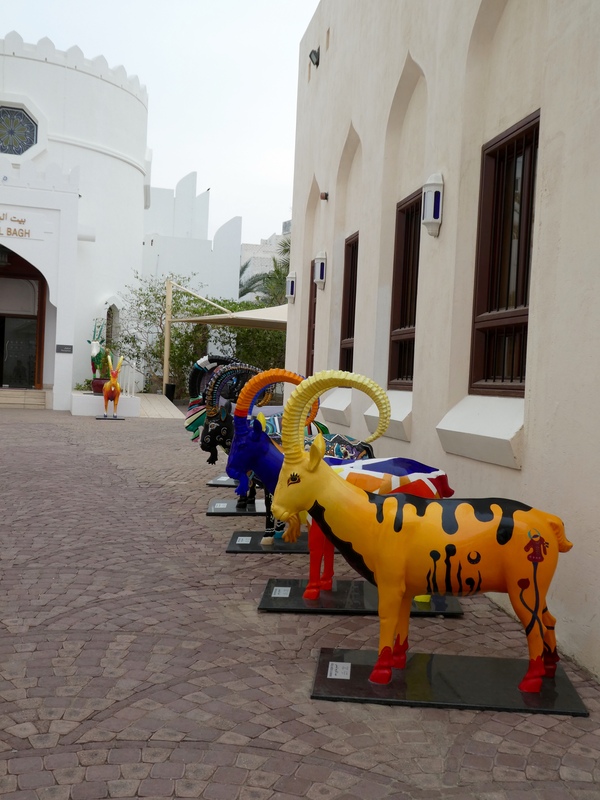 This Omani venue comfortably seats 1,100 patrons. Now the outside floor is being polished. 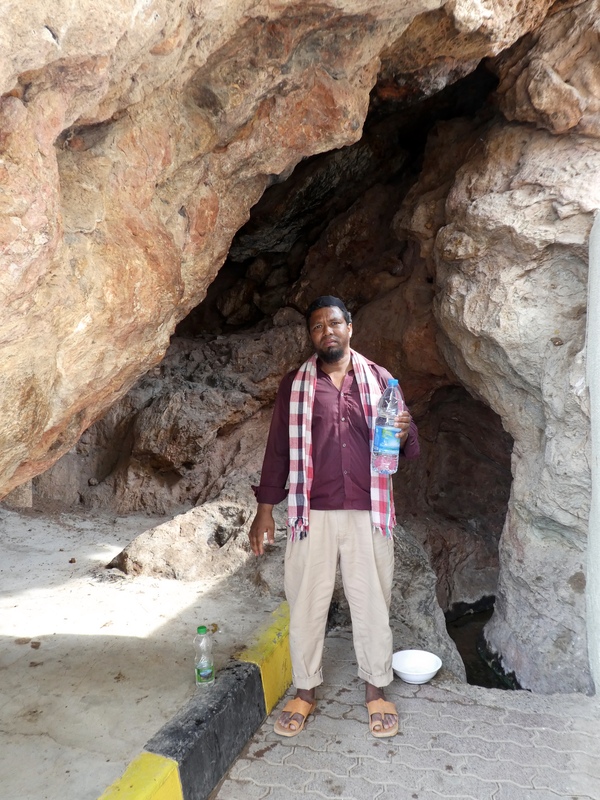 Our Omani guide wears the traditional white robe. We have been told this attire is comfortable and cooler in the oppressive summer heat of the desert. Entering the lobby is our guide and Chanel’s mom. The lobby only is now open to visitors. Even not being allowed to go inside, we are grateful seeing the exterior of the concert theater. I, Zeb the Duck, am sitting on the table of the the lobby. The floors and table, recently polished, really glisten. West Side Story will come to Muscat in late February. We always enjoy seeing that musical. After existing the lobby, we stroll on the covered outside walkway. A few turns and we see the lovely gardens. The opera house complex features a concert theater, an auditorium, formal landscaped gardens, a cultural market with retail space, an art center, luxury restaurants and a large parking garage. 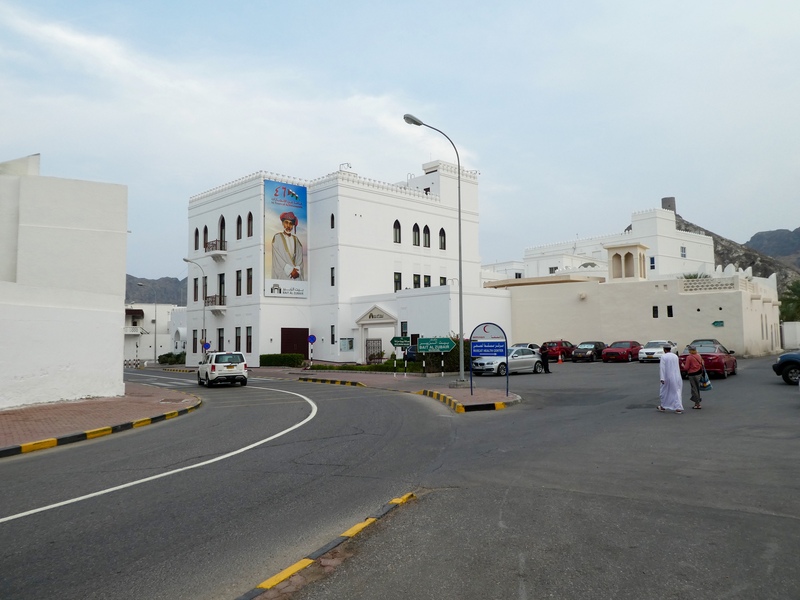 This complex was built following the Royal Orders of Sultan Qaboos of Oman. These beautiful buildings, all making us feel very peaceful, can make this duck, a small bear and 3 humans hungry. Our guide drives us to the cafe. 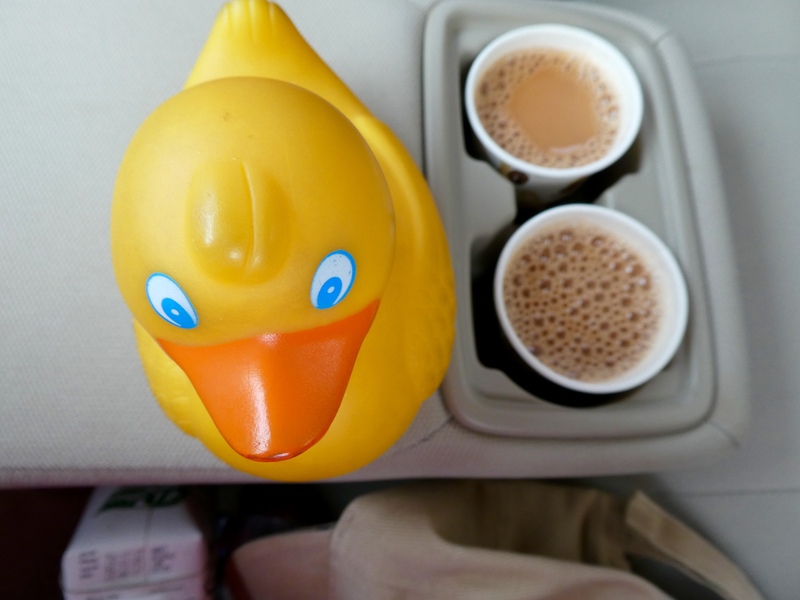 We enjoy a special Omani tea. It is frothy, but definitely tastes like tea. I like it! 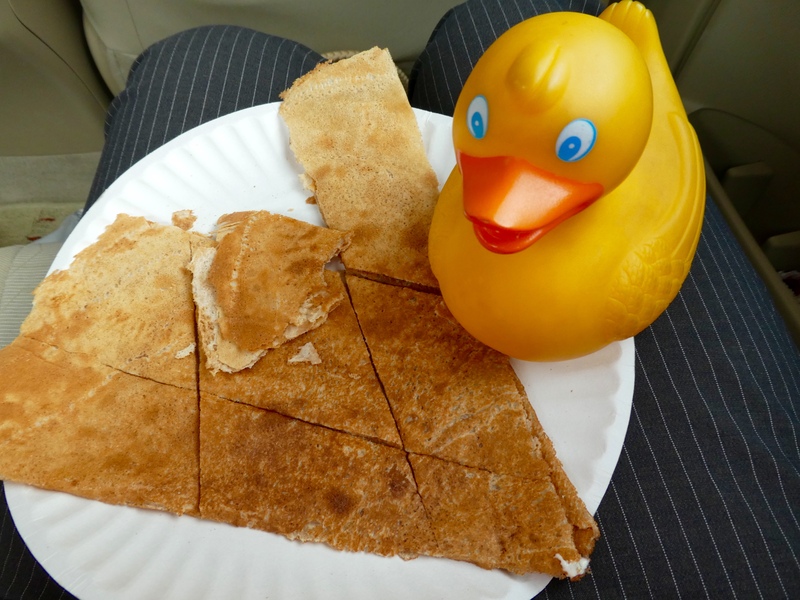 This Omani bread has honey in it. Tasty and pleasantly sweet; not overpowering sweetness. Our guide had bread with everything: cheese, egg and honey. I wasn’t too sure about that many flavors in the bread, but after sampling some, I liked it a lot. We are enjoying our short time in Muscat, Oman. We visited in mid February so the weather was in the mid 70s F. It was overcast much of the time, but we were comfortable, always felt safe and very welcome. 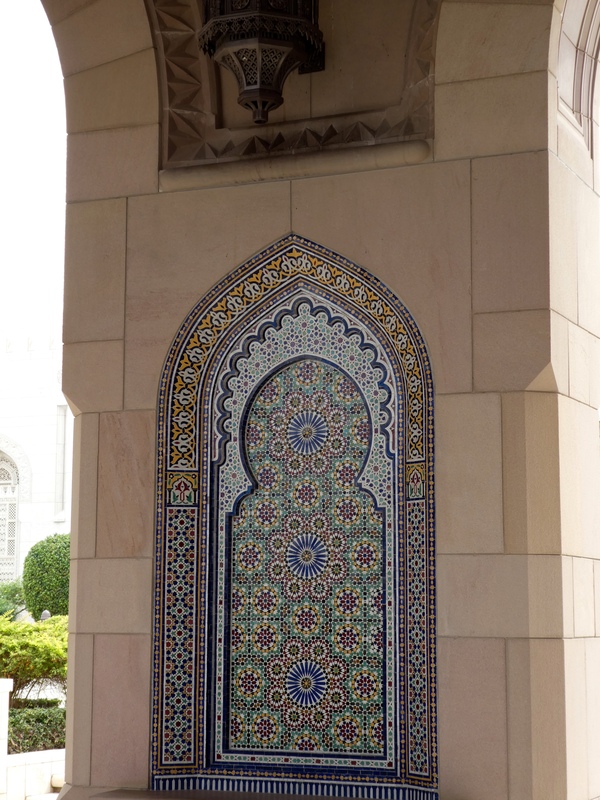 Next time we will show you more of Muscat, Oman. 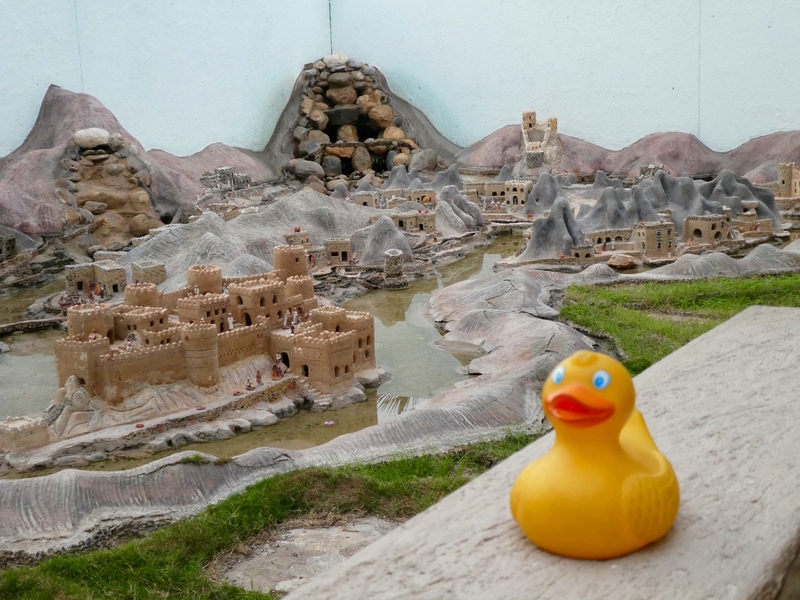 Abu Dhabi and Dubai have so many beautiful new buildings but Chanel the Bear and I, Zeb the Duck, wanted to see an old city and old buildings. 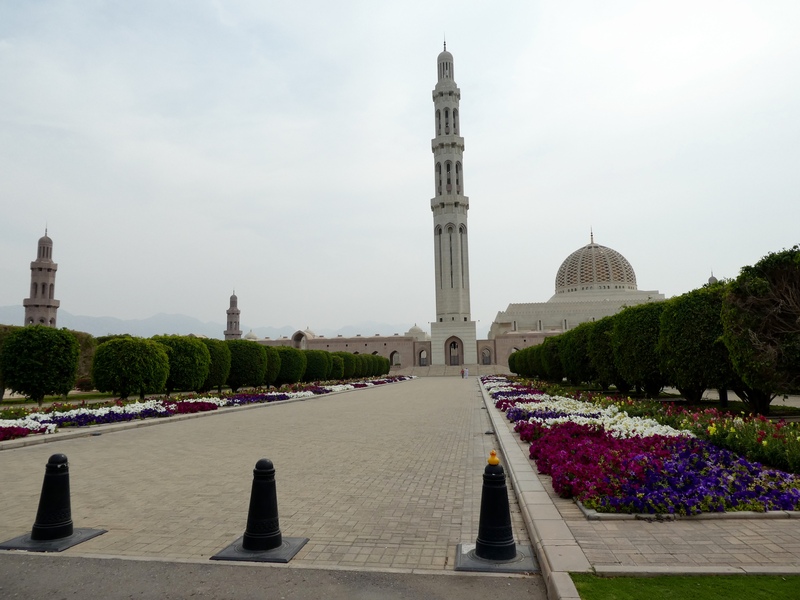 We took our moms to Muscat, Oman a city known as an important trading port since early in the first century. Our taxi driver delivered us to the Abu Dhabi airport where we had our first eye scan, purchased and enjoyed fresh Saudi dates, stuffed with various nuts. So good! Our moms like to be at the departure gate a little early and it was good that they were. Our full plane left Abu Dhabi a little early. 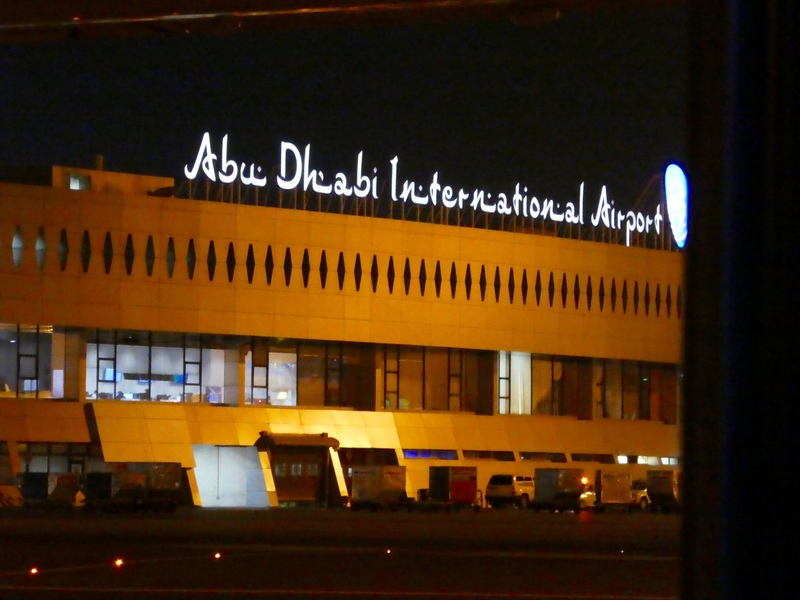 In our one hour and 10 minute flight, we left Abu Dhabi, enjoyed a light lunch; we had vegetarian sandwiches, bread sticks with dip, mini pretzels, water and mango juice. The flight attendants on Oman Air were fast and very busy. In Muscat our guide met us at the airport. Our private tour was reserved for 4 hours. Our fantastic guide extended our tour to 5 hours. Yeah guide! There is so much to see. 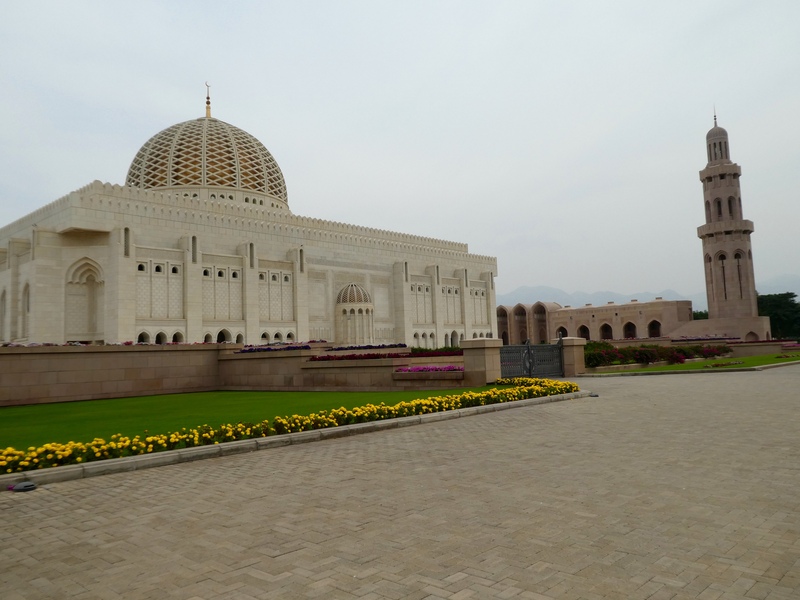 Our first stop, Sultan Qaboos Grand Mosque. 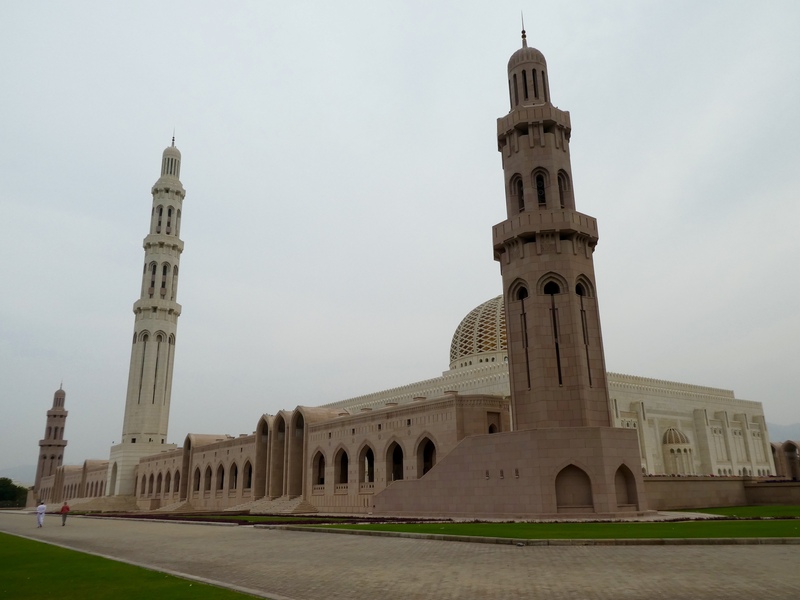 This mosque, Sultan Taboos Grand Mosque, competed in 2001, required 6 years to complete. This is now the 11th largest mosque in the world. When it was completed it ranked higher, but new mosques, bigger and more elaborate, are being built. The Grand Mosque was not open to non Muslims at this time, but the building is spectacular and is worth a visit, just to see the outside. The entrance consists of a long walk way with well tended gardens. I am sitting on one of pillars to keep vehicles out. Intricate designs adorn the structure. Looking inside, the greenery is beautiful. The arches offer a wonderful view and the floors gleam. Walking to an end of the building this area invites peaceful thinking or meditation. Imagine no traffic noise, surrounding desert and nearby mountains under clear, blue skies. We admired the large dome. A long walk to the main entrance and then a left tun down the main walkway and to our car. Inside the mosque is the second largest hand knotted carpet in the world. This carpet, 70 meters by 60 meters, took 600 women 4 years to complete. The large chandelier, 14 meters tall and weighing 8.5 tonnes is inside also. The carpet and chandelier were the largest in the world when completed, but now the largest carpet and chandelier are in Abu Dhabi. We showed you pictures inside that mosque in February. Near the Grand Mosque our guide took us to the magic water. The water from the mountains flows into the cave. A man was inside and graciously posed for us. This is a tub that can be filled with magic waters that seem to have healing properties. Mom thinks it is similar to our hot springs in the Rocky Mountains of Colorado. 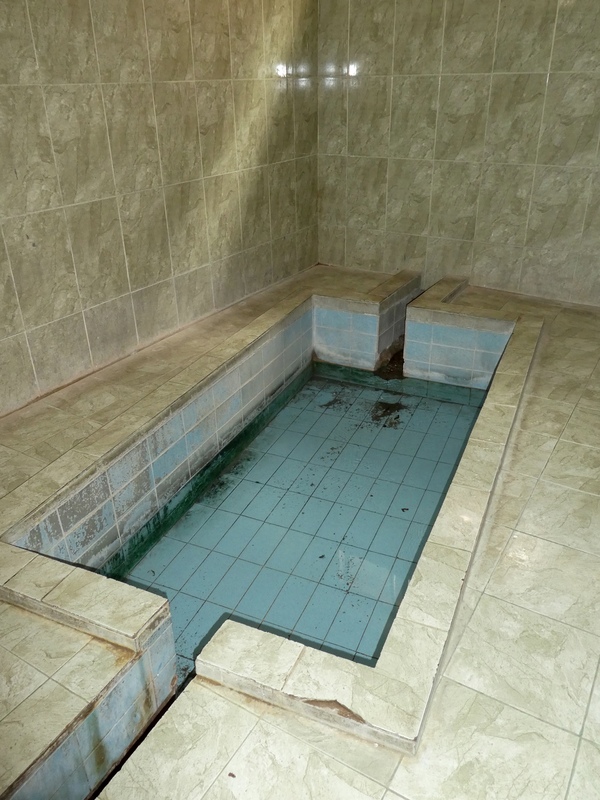 The hot mineral springs relieve much stress and many pains also. Although the mosque was closed to us and the tub was not full of magic water, these places were definitely worth seeing. 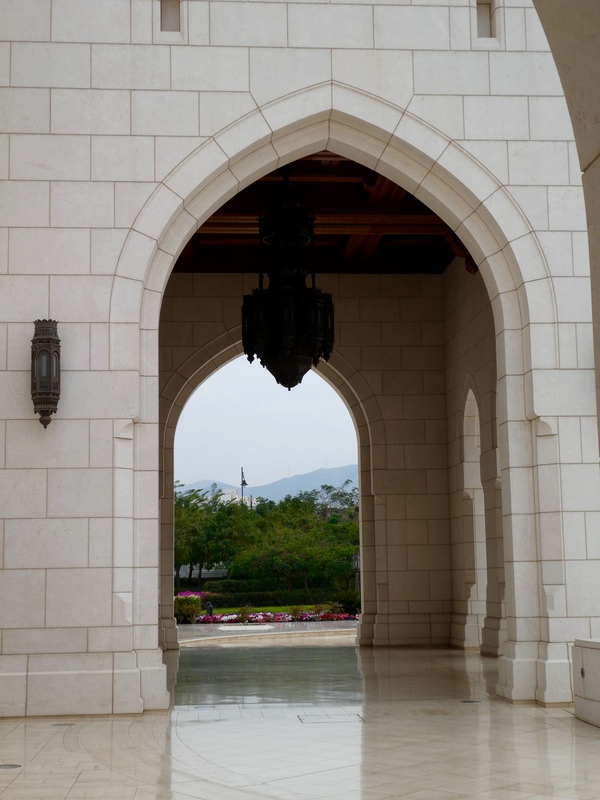 Next time Chanel and I will show you more of Muscat, Oman.